Whatever name it goes under, the art has had a long and savage history, dating back to 1521 when Spanish rule first came to the Philippine Islands. Before colonization by Spain, Escrima was taught as a recreational activity, along with reading, writing, religion and Sanskrit. The Spaniards had a hard time imposing their rule on the inhabitants, who wielded their bolos, daggers and sticks with fierce and deadly effectiveness. Not until they brought in reinforcements and firearms could they affect any semblance of order. In the 1700s, when Spanish rule was firmly secured, the teaching and study of Escrima was banned (in the same way as the Japanese overlords banned the ownership of weapons on Okinawa ). The carrying of a bolo (a long bladed weapon similar to a machete) or dagger was also forbidden. These orders were imposed in an attempt to "civilize" the spirited Filipinos. Escrima then became a clandestine art (as did the art of Karate on Okinawa ) and was practiced in secret. When it re-emerged, it went unnoticed by the Spaniards. It had been set to native music and performed as it was, without weapons, the movements resembling only a harmless dance. This "dancing" even became popular with the rulers and demonstrations were given in public at fiesta time. The real Escrima had not died though, as the Spanish soldiers found out every time there was a revolt. From generation to generation, the many different regional styles, collectively termed Escrima, were kept alive and handed down from father to son over the centuries. When Spanish rule ended and the Americans took over in 1898, the ban on the art was lifted. Friendly competitions were then conducted in public at fiestas but the teachers never "opened their doors" and Escrima remained a semi-secretive activity. The country was to see a lot more martial arts action in the ensuing years. When the war came, the Japanese invaded the Philippines and a lot of Filipinos worked alongside the Americans in guerilla units. Many of them owed their lives, in countless close-quarter engagements, to their Escrima training; the custom-issued machete closely resembled their native bolo. This is an art that has been well and truly tested over a long period of time in actual combat. After the war, many Filipinos had emigrated to the USA --needless to add, Escrima went with them. Most of the immigrants went to Hawaii and California . Of those that went to California , the majority settled in Stockton and it is from there that Arnis / Escrima surfaced onto the American martial arts scene. The "discovery" of Escrima, along with the widespread use of the Nunchaku weapon, must be credited to the late Bruce Lee. His portrayal of the use of the "double sticks" in the movie "Enter the Dragon" and the unfinished "Game of Death" brought the art of Filipino Stick Fighting out into the open. Bruce Lee was taught Escrima by his student and friend, Danny Inosanto, who had in turn been trained by a distinguished Escrimador (the title given to practitioners of the art) in Stockton , California. The Filipino Martial Arts is virtually unknown to the general public because of its late entry into the mainstream martial arts world. What hasn't helped the popularity growth of Escrima is the stigma attached to how it is taught. Escrima is noted for using weapons, usually sticks, as the primary tool to learn the basic concepts of the art, with the secondary focus being the empty hands. The idea of just picking up a stick or any weapon is a scary thought, and avoiding rather than exploring the beauty of the art seems safer and is less time consuming. Latosa developed his unique style of Escrima using the fighting concepts from several of his well known instructors and from his family system taught to him by his Father. He developed a teaching system using concepts instead of techniques to ensure a high level of retention among the students. What is misunderstood most about Escrima is the idea that the stick is only a tool used to learn the art's basic concepts. Actually, the stick represents using any type of object, as well as the empty hand, to protect yourself. What you have is a truly unique system which students learn to master weapons while concurrently learning how to use empty hands. In most other martial arts systems, the line of progression is to master the empty hands before you can go on to learn weapons. Using a stick to learn the martial arts unearths a visual fear of getting hurt or hurting someone (especially in the hands) while training. This is especially true when an individual has had no previous martial arts training. There is also that mental picture or fear of an attacker taking your weapon and using it against you. Nevertheless, weapons seem scary and rightfully so. There are right and wrong, safe and dangerous, methods of teaching students how to handle and respect weapons. The same rationale holds true for other day-to-day types of activities such as learning how to drive, wiring a lamp, swimming, flying a plane, jogging, weight lifting, cooking and other skills. Doing something in the wrong way can spell disaster. Learning Escrima is as safe as the instructor who teaches the art. Everyone is mindful of the fact that very few people walk around with a stick in their hands, so they believe that the art doesn't apply to them. However, as stated before, the stick only represents forms of weapons such as a set of car keys, a fountain pen, a newspaper, a water bottle, your cell phone as well as your empty hands. The idea that people can only use their fist or a kick to effectively fend off your attacker is something you may see on television or in the movies. The truth of the matter is that knowing how to use these concepts may save your life or the life of your loved ones. The beauty of Escrima is that there is very little difference when using your empty hand and using a weapon. There is a smooth transition between the two because the art is taught using concept instead of techniques. Like in everyday life, we never know what to expect. We never know who we are dealing with that day, what business deals we have to make, decisions that have to be made, so we have to react with the ability to be flexible and rationale in what we do. In the basic survival skills the same applies. What are the attributes of an attacker? An attacker comes in any shape or form. They could be stronger then you, faster then you, have knowledge of the martial arts, and could be a veteran in street fighting, just to name a few attributes. An attacker can attack from the front, but usually it will be from your blind side. If you hit your attacker with your hands or with a kick, you may end up hurting yourself more then your opponent, or if you don't execute the defensive attack with any strength, it wouldn't stop the person anyway. A weapon, on the other hand, has no nerve endings, bones or skin, and unlike your hands and it doesn't hurt or feel pain. Think of it, if you don't have the same strength as your attacker, you might not be able to stop the attack. In the same setting, if you had used an object like car keys and you hit your attacker in the face, this may allow you the time to run or call for help. The harder the object, the more damage the weapon will do against your opponent with less applied strength. Hitting an attacker with a weapon, especially if it will save your life or someone in your family, is warranted. That is the harsh reality. Training in the Filipino art of Escrima teaches a person to use everyday objects as a weapon or in more civil terms, levels the playing field. Escrima teaches the basic and logical concepts in using weapons (focus, speed/timing/distance, power, balance and transition) , These concepts are so logical and pure that a person can actually use them in living their everyday life. For example, the most important concept is balance. Balance is the foundation of Escrima as well as most tasks we perform throughout our lives -- knowing how to obtain it, and when you get off balanced, how to get it back. Balance is a key that opens the other concepts necessary in the martial arts. Balance is truly multi-dimensional. Think of balance in terms of learning how to ride a bike. There is more then just getting on, peddling and keeping the bike upright. The bike has two wheels, and the main objective is to keep it going forward by balancing the front wheels against the stationary back wheels while moving forward. If there is too much weight to the left or to the right, the bike will tip over. The rider must be able to balance their focus to make sure they don't ride into a ditch or a tree, and also look ahead at the cars on the road, people walking, plus be aware of what is coming up from behind. So far, that seems pretty easy but now there is an issue of speed and controlling speed so that the fast approaching tree won't be the collision point. And what about those traffic lights? Eventually there has to be a time to stop. This is the braking point, which also has to be balanced. When there is sudden braking applied to the front of the bike, there is a chance the rear of the bike could easily become the front of the bike, or even flip over. If there is too much brake in the rear and not any pressure on the front, this may not be enough to stop. All these tasks have to be balanced or it becomes unsafe to ride a bike for both rider and everyone else who occupies the road. If you look closely to this objective of riding a bike, the Escrima concepts are exactly the same. There is the balance which becomes the foundation of the system. Speed (timing, distance) is the element of execution as to when you can hit your attacker. Power is driven by the foundation of balance, dictated by the distance and the speed of the attack or offense movement. Your focus is expanded to look at the person as a whole rather then just focusing on the oncoming attack. In other words, if you look too much at one hand, you may never see the other hand. Transition is the ability to use a comb, brush or keys without radically changing any physical movements, as you already know. The objective is to neutralize the situation, not focus upon whether the attacker throws a right hands or a left hand; the main objective is to nullify the attacker. Escrima makes use of concepts as the main catalyst of learning and increasing the rate of information retention. 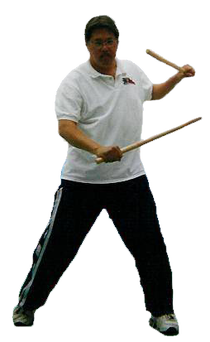 In Escrima, techniques are used as a device to practice concepts. Techniques teach a person how to apply the concepts in a practice setting. Concepts are applied as needed in various circumstances and this provides more flexibility and adaptation in the execution. This is Latosa Escrima.